Verse 14 tells us that Joseph, Mary & Jesus set out for Egypt at night. Cool, blue tones from the starry night sky are offset by the warm tones coming from the torch that Joseph is carrying aloft to light their way as they start out on the journey to Egypt. Joseph (with torch), Mary carrying Jesus on donkey. There are two versions of this scene. This is what I call the “night version.” I have increased the cool, night time blue hues, which tend to wash out the warmer brown hues of the figures & landscape. The blues help to show this is a dark, night-time scene. In the previous picture you will see the same scene, but with these warmer, yellow/brown hues intact. The stable from previous scenes can be seen in the background. 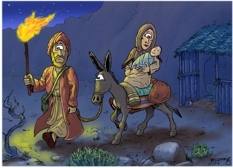 Notice that Joseph has a shoulder bag, & the donkey is carrying bags, a waterskin, etc. Anyone travelling in the wilderness of ancient times would need water, food & other provisions. Apart from the hot, dry climate, wilderness travel would have been potentially dangerous, with many hazards. Rough, rocky terrain would have been difficult to navigate. Steep cliffs, precipices, wild animals & bandits would be a few of the additional dangers of such a trek. The brook of Egypt was the border bwteen that country & Israel, so was the minimum distance Joseph would have taken Mary & Jesus. Not that Joseph would have gone to the pyramids, but the distance involved in that trek (on foot) is amazing! The rock types of the area in & around Bethlehem are mainly limestone, dolomite, dolomitic limestone, marl, chalky marl, chert & chalky limestone. According to geological maps Bethlehem is situated on the Menhua Formation (Chalk, chert). Although you can’t really tell from the cartoons, I have made the soil/rocks look like limestone. They are coloured blue due to this being a night scene. The plant in the foreground is Wormwood (aka mugwort, Motherwort, Bulwand, green-ginger, Sailors tobacco (Artemisia sieberi.)) Wormwood is a steppe plant, dominantly growing in the dry Judean desert & in the Negev. Arish. The city grew around a Bedouin settlement near the ancient Ptolemaic Dynasty outpost of Rhinocolura. In the Middle Ages, pilgrims misidentified the site as the Sukkot of the Bible. Arīsh means “palm huts” in Arabic. 1) The Brook of Egypt is the name used in some English translations of the Bible for the Hebrew Nachal Mitzrayim (“River of Egypt”) used for the river defining the westernmost border of the Land of Israel. 2) Alternatively, early Aramaic translations and Jewish commentaries identify the Brook of Egypt with the Pelusian arm of the Nile—a no longer extant branch of the Nile lying on the border of Ancient Egypt. If the Brook of Egypt were a branch of the Nile, & Joseph & Mary walked there, then that’s at least 100 miles ( km) further into Egypt than the brook near Arish!